Indian Prime Minister Narendra Modi’s demonetization of 500 and 1,000 rupee banknotes has thrown India’s economy and financial systems into turmoil. Local residents now struggle to obtain cash to support and finance their day-to-day living. The government’s restriction on gold importation is also affecting the general population, as 78% of Indian households store their wealth in gold. As a result, an increasing number of investors, traders and households are seeking for safe haven assets like bitcoin. In the aftermath of the demonetization of 500 and 1,000 bank notes that shocked the Indian economy, the Indian government effectively imposed tight regulations on gold importation and confiscation, raiding households and villages to forcefully seize jewelry. Indiatoday, a local publication based in Nodia, confirmed with a senior IT official that raids have taken place in large cities such as Delhi and Mumbai to seize gold and jewelries. The official also told Indiatoday that jewelers are targeted by the authorities as they may trade their gold in the Indian black market. As the demonetization of the two banknotes and restriction on gold trading begun to severely affect the Indian economy, Prime Minister Modi laid out some short-term strategies to offer higher liquidity for cash users. On December 9 for instance, Modi promised 100,000 villages two electronic payment machines per village, in an attempt to resolve the shortage of cash. Despite the attempts of the government to mitigate the damage caused by its recent capital control regimes and demonetization, Indian households, businesses and investors have begun to move on to other assets that could protect their wealth from tightening financial regulations. With gold being targeted by the authorities, a large number of traders have started to purchase silver to eliminate any possibility of their storage of gold being targeted by the local authorities. As a result, the demand for silver significantly increased over the past few weeks. Fergal O’Connor, a senior lecturer in Finance at the University of York, stated that a 10% reallocation from gold jewelry investment to silver could double world silver demand, which could cause a drastic change in the silver market. Apart from silver, a fairly large number of investors and people have shifted their focus towards bitcoin. The mainstream Indian press and media have started to report on the rising demand for bitcoin and its advantages over physical assets like gold or silver. 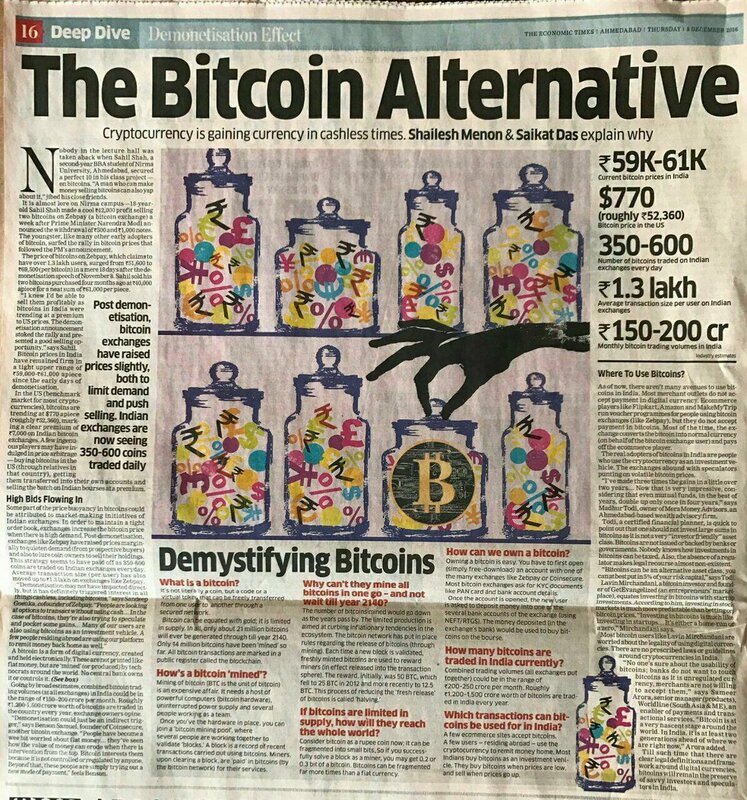 In a recent edition of the Economic Times newspaper, analysts Shailesh Menon and Saikat Das noted that the demand for bitcoin amongst local users is surging on bitcoin exchanges like Zebpay, as investors and users purchase bitcoin at a premium price in the range of US$850 to $1030. Sha also stated that him and other traders recently sold bitcoin at a 42,000 rupee profit, which is equivalent to $622. The rising demand for bitcoin is also evident on peer to peer and over-the-counter markets like LocalBitcoins, which have experienced a substantial increase in trading volumes over the past month. In the beginning of November, the weekly trading volume of bitcoin was estimated to be $165,000. In late November and December, the weekly trading volume on LocalBitcoins India reached $408,000, demonstrating a 2.5x increase in trading volumes. Menon and Das, the two analysts at Economic Times India, also emphasized that Zebpay and other leading Indian exchanges have significantly increased the trading price of bitcoin in several parts of India that have higher demands. Because of the initiatives of local exchanges maintain a tight order book, there are substantial differences in the buying and selling prices of LocalBitcoins and local bitcoin exchanges. On Average, LocalBitcoins users sell and purchase bitcoin at around $850, at a $100 premium to global bitcoin exchanges. However, exchanges like Zebpay show a price range of $980~$1030, which could attribute to the rapid increase in the weekly trading volumes of LocalBitcoins. “In order to maintain a tight order book, exchanges increase the bitcoin price when there is high demand. Post demonetization, exchanges like Zebpay have raised prices marginally to quieten demand,” said Das. As capital controls, demonetization and restriction on physical assets continue to affect the general population of India, analysts predict that the demand for safe haven assets like bitcoin will drastically increase in the upcoming months. What do you think of the rising demand for bitcoin in India? Let us know in the comments below.